-A relationship with a very good dog friendly vet, better yet, hunting dog friendly vet, not a pocket pet vet. -A good well balanced Large Breed puppy food, we have been quite content with Purina Pro Plan Focus Puppy; we like the way our puppies look and act while on it! Our vet also recommends Purina Pro Plan as well as Science Diet. If you decide to switch foods, we will send you home with enough puppy food to make the switch gradually. -A plastic puppy crate, increase the size as the puppy gets larger. ​-If you are a newbie to labrador retrievers, a good training guide, dvd's are in order... some suggestions: The Wildrose Way Retriever Training DVD with Mike Stewart , George Hickox Training the Upland Retriever DVD, Gun Dog: Puppy Training with Jeremy Moore. Check out GunDog Supply for their large selection of training Books and DVD's and materials. Below is an excellent video on Puppy Training by Wildrose Way. They do it the way we would when we keep a puppy for ourselves! ​People often ask us who we recommend for a trainer in the future... well... hands down Kent and Rhonda Baxter of Baxter's Bird Dogs are the best in our book. They are professional, small, very experienced with our pointing labs, they only take upwards of four dogs at a time, they are dedicated and serious, they will treat you and your dog with the utmost of respect... they have a beautiful housing set up, they are very hospitable to you when you come (realizing you are entrusting them with your baby), and they will spend time with you teaching you what to do with your newly trained dog. 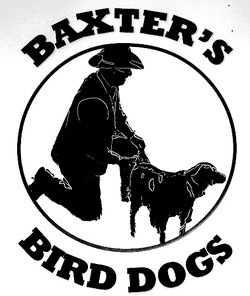 Press on the Baxter's Bird Dogs Logo to be linked over to their website. Below are tips from the Baxters which are helpful for those getting one of our puppies! As the new training season begins we would like to give you a few tips to help you and your hunting buddy to get ready for Baxter’s Bird Dog boot camp. When your puppy retrieves your favorite shoes, don’t get mad, find a favorite toy and swap with them. When they have the toy in their mouth, love them up. This tells them that they get more love with the right thing and it doesn’t deter the retrieving aspect of the hunting game. Whoa or sit - For those of you who have pointing breeds – a great way to get your puppy under control is to use the word “WHOA” (meaning stand on 4 feet don’t move) – for those who have flushing breeds – use the word “Sit”. When putting your dog’s food down for them, hold them back with the food in their line of sight, tell them Whoa or Sit, wait a few seconds (vary the time), and then release them to eat. Dogs learn from repetition. This also establishes you as the Alpha of the pack, second it is a valuable tool for getting them under control if they are running towards a dangerous situation, these commands started early in life get the dogs to listen to you, it also helps us out when we are working with them on training. These commands cut down on the time we spend on the basics and allow us to get down to the nitty gritty of bird hunting. If you are using the bird wing on the fishing pole, remember never let your puppy catch the wing, and only play for a maximum of 5 minutes. Never want to frustrate, or bore your puppy. All of you are always welcome to come and visit anytime, we are more than happy to have you come with us when training and watch and learn. Thank you for your confidence in us and we look forward to meeting all of you. Please feel free to call us with any questions anytime.